Walt Disney once said: “It’s kind of fun to do the impossible.” He likely wasn’t referring to navigating his legendary theme park with a toddler, yet this has become my mantra when I bring my almost-three-year-old to Disneyland. As a proud Disnerd, I’ve already taken two multi-day trips to Disneyland with my son, and plan to take many more. He’s in love with many of the characters (Mickey and Woody are tops) and is always game to try new things. Though a trip to Disneyland with a toddler may not be everyone’s dream, with a little prep, planning and patience, you can make it a magical experience that at least one of you will always remember. My best advice for taking a toddler to Disneyland is to go before they turn 3—perhaps just before they turn 3. Any guest under 3 years old doesn’t require a ticket, so definitely take advantage of the cost savings (around $100 per day!) while you can. That was part of the impetus for our last trip. Most frequent visitors to Disneyland know there is no longer a “slow” time of year, but crowds are usually smaller in January and February. Keep in mind, however, this is also the time of year Disneyland completes the most maintenance, so there’s a chance your favorite ride may be down during a late winter visit. Peak times include most of summer, around spring break and during the lead up to Christmas and New Year’s Day. As for days of the week, your best bet is usually going to be during the week (just watch out for those popular three-day weekends). And, if you can, start your day early and get to the park about 30 minutes before it opens. Crowds and heat will be minimal first thing in the morning, allowing you to maximize your magic. Okay, a bit of controversy here. If you’re reading this and Star Wars: Galaxy’s Edge has already opened, consider skipping a Disneyland trip with your toddler. I know, who would want to miss out on this amazing new experience? However, your child likely won’t meet the height requirements to ride either of the attractions, and the rest of the park will be packed. Applesauce or other squeeze packets and granola bars—these travel easily and are a quick snack. Reusable water bottles—ice cold water is free at all of the quick service restaurants around the park, while a bottle of water will run you $4. A good bag. To cart everything you need to the park, you could bring an unwieldy diaper bag, but I’ve found a small sling bag works great. I brought this one with me and was able to squeeze in three diapers, wipes, baby powder, apple sauce packets, fruit snacks and granola bars, hand sanitizer, sunscreen, and a small first-aid kit. It’s actually my go-to daily bag with my little guy and holds more than you need for one day at Disneyland. Another option for souvenirs for the budget-conscious who don’t mind a heavier load throughout the day, is to buy souvenirs ahead of time. You can easily find stuffed animals and other Disney-branded goodies at stores near you or online for less than they are sold in the parks. If you like to pre-plan, this is a good way to do so. Here’s where things get a little controversial once again. I’m going to tell you to skip the stroller. We once brought a fantastic reclining umbrella stroller and my son sat in it for all of about 15 minutes, and the rest of the day, we carted it around empty. YMMV, but I’ve found if you pace the day right and take a break in the afternoon with a parade or better yet, a relaxing show, you probably don’t need to bring a stroller, as your little one may largely be powered by excitement and a bit of sugar. (Check out the Mickey and the Magical Map live show in Fantasyland for at least 25 minutes of shade and seating). Of course, if you find yourself in need of one, they are easy to rent for your day in the park. One quick no-brainer: Download the official Disneyland app. Not only does it offer current wait times around the park, you can also make table-service reservations and order ahead at many quick-service restaurants, making one less line you and your toddler have to endure. Bonus app: The Play Disney Parks app offers themed games, many of which interact with the ride queues and can help keep your toddler Happy, rather than Grumpy, when waiting in line. Now, once you’re in the park, here are my top do’s and don’t’s with a toddler in tow. Pirates of the Caribbean. It’s mellow enough to not be too scary for most kids, and a couple little splashes starts the ride off with giggles (plus, with a 16-minute ride time, it’s a great way for adults to get some downtime). Disneyland Railroad. Who doesn’t love a leisurely train ride with lots of scenery and people-watching? And with nearly 20-minutes to circle the park, its another nice way to wind down. Finding Nemo Submarine Voyage. This is another relaxing ride that toddlers love, though skip it if you get claustrophobic. Autopia. Kids love cars—what else can we say? Dumbo the Flying Elephant. A classic. Most of the dark rides in Fantasyland. I know this is sacrilegious, but some of these rides are loud and can be scary for younger kids. The exception here is Peter Pan’s Flight, though with a wait time that can exceed 45 minutes, plan to do it first thing. Also, check out The Many Adventures of Winnie the Pooh in Critter Country—one of the best dark rides for toddlers. If you want to catch a glimpse of many characters, but want to keep an arms distance (some kids can be a little unnerved by a six-foot-tall Goofy), a parade is your best bet. Currently, Disneyland offers just one parade twice daily–Mickey’s Soundsational Parade. Saving spots for the parade is strictly verboten, so plan to corral your family 30-60 minutes prior to the start of the parade and settle in. This is a great opportunity to relax and share a snack. Cast members keep the park so clean, I don’t even recommend carting a blanket to sit on, but if you’re especially germaphobic, sitting on a light jacket or sweater should do the trick. While this guide is geared toward a toddler-centric day, you may wish to sneak in a bit of big-kid time. If so, definitely take advantage of Rider Switch. This service allows an adult in your group to wait in line and ride an attraction while you wait and play with the kiddo and when that rider is done, you can hop right on the ride. Free diapers. Free is always good and if you are in need of diapers in the park, Huggies provides them free of charge in the Baby Care Center near the end of Main Street USA. First Aid is located here, as well, and offers everything from storage of refrigerated medications to bandaids and OTC medications to guests. Quiet areas. 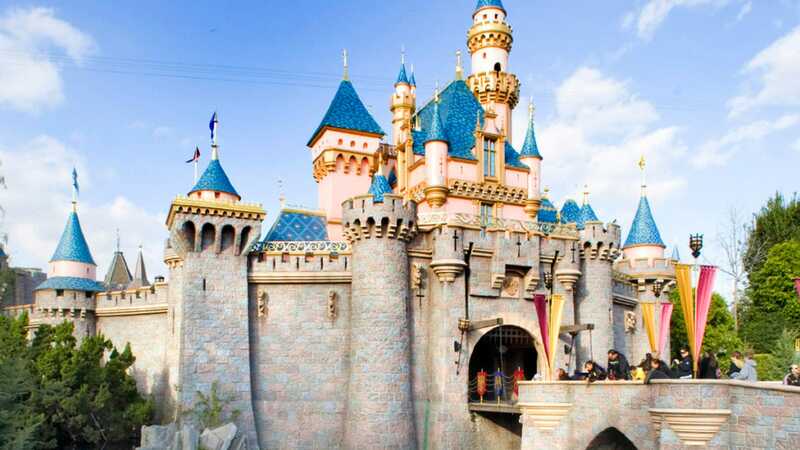 Visiting Disneyland can be overwhelming for anyone and if you are traveling with a family member who may have a cognitive disability, Disneyland has spots for you. Just ask a Cast Member and they will direct your family to one of these quiet locations. Unless you’re traveling with an older child who isn’t inhibited by height restrictions, skip the new digital MaxPass. Since most of the rides featured in it have height restrictions that many toddler’s don’t meet, you’re better off saving that $10 per day (per person) for a meal or a souvenir. When staying at a hotel near the Disneyland Resort with a toddler, Amazon Prime Now is your friend. You’re already carting a car seat, multiple bags and carry-ons and an energetic toddler, so why not pack light? Rather than pack all the essentials, I place a Prime Now order ahead of my trip, to be delivered to our hotel. Diapers are a must for our yet-to-be-potty-trained little (you will save so much luggage space by shipping a pack) and I include many of the snacks listed above (including the fresh fruit). For the hotel, I also recommend bringing some light rope and Command hooks. No, this isn’t for anything weird, but rather to create a “room” for your toddler if he still sleeps in a crib. Securing the rope across a small section of the room between the hooks and laying a flat sheet over the top gave my son his own little space to fall asleep and minimized distractions that can come with sleeping in a new place. And the best bit of advice I can give as you head out to the parks is to just enjoy the time. With so much to see and do, it’s definitely overwhelming, so just succumb to the fact you won’t experience it all in one trip. Once you give in to that, all that’s left to do is take in the magic, both as a parent, and as a big kid yourself.